I never hear the call to make things that involve coconut, that’s because I don’t have it in the cupboard. 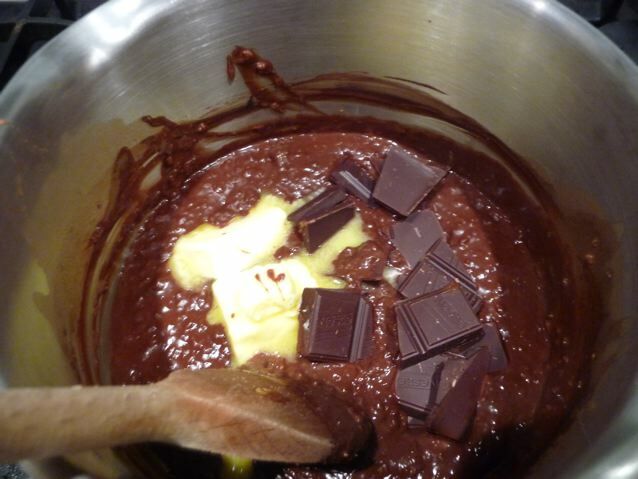 However I do have chocolate, cocoa, flour, golden syrup, vanilla, butter, oats, raisins, egg, soft brown sugar, and one tin of stout left over from bun making – yes, all present – so I don’t have to go shopping for some obscure ingredient. This is the first time I have mixed a cake entirely in a saucepan; so the kitchen was disappointingly tidy all the way through, unlike when I make bread. 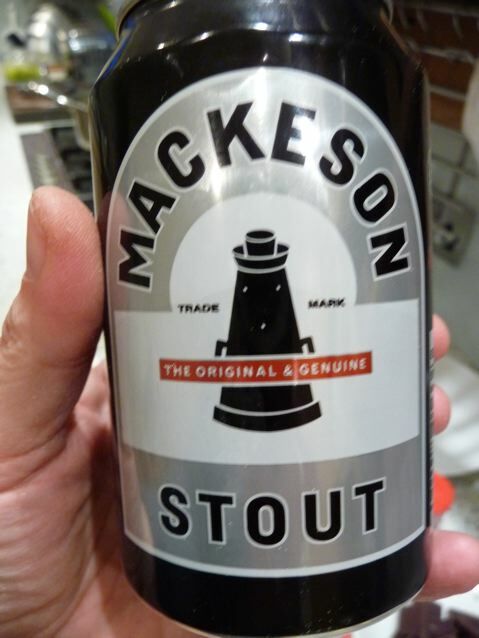 Mackeson’s stout is a classic, sweet and creamy black beer made with milk lactose and whey. I Googled it to find out what was in it. Wikipedia inform me that is why there is a milk churn on the tin. I never notice things like that unless they are pointed out to me; I thought it was a rook from a chess set. It feels a bit crazy pouring a can of beer into a saucepan and boiling it up with oats and cocoa as the first stage of a cake – cocoa beer porridge – reminded me of Babette’s Feast where the sister is making ale-bread soup. But I have already used stout in Dan’s new Easter bun recipe so I was on familiar territory. I am quite proud of my home made vanilla essence, something I learnt from Celia at Figjamandlimecordial which also features in this slice. 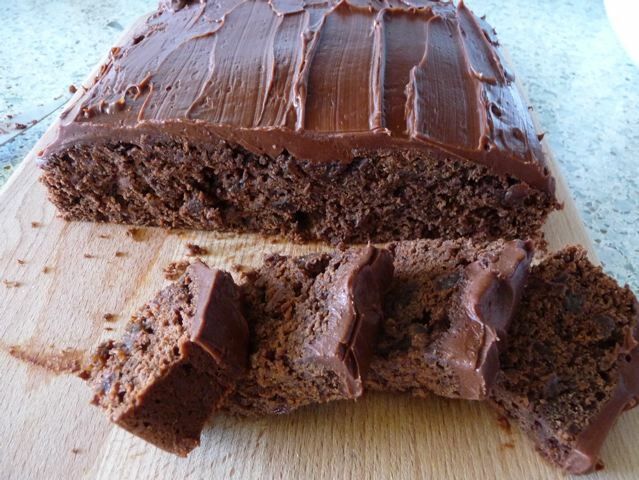 This entry was posted in Cakes, Chocolate, Recipes, Sweet Stuff and tagged baking, cakes, chocolate, Dan Lepard, Mackesons, raisin, stout on 17/04/2010 by Joanna. and a bowl for that if you have to! This looks very good, I can’t understand why I’ve missed the recipe so far! What size baking tin did you use? I can’t see a size mentioned in the recipe. PS – I like the look of Dan’s Guardian recipe today(17th April) – I said before that if anyone can tempt me to bake bread, then he can! Another recipe to add to my list to make! That looks so moist and delicious. Chocolate and raisins are a superb match. Really good with a big dollop of sour cream for a pudding, Cittyhippy! Ah ha, now I know to which “porridge recipe” you were referring! Certainly looks like one I would like to try and I like the idea of it being all in one pan. Brownies and flapjacks are the only things I’ve achieved this for (I think). to the oats and stout. Joanna, I made this yesterday and have to say it was a resounding success. 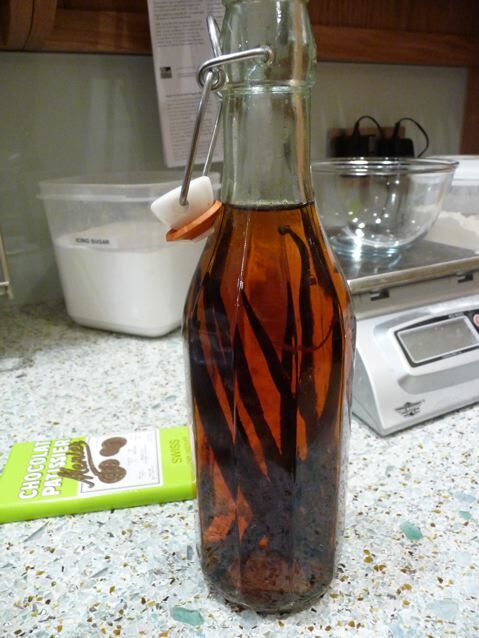 I didn’t have any stout so used a bottle of real ale instead, but it certainly gave good results. Am getting horribly behind with my posting at the moment so this may take a while to appear on my blog. Choclette, I’m happy to hear it worked for you! I take no credit for it, only for my enthusiasm :) Speaking of Dan Lepard recipes, there are some amazing new ones he has just put on his site for cakes with tamarind in them – hope to try them sometime soon!